Ok, anyone who's been around here for a while would remember my 3D printer thread about the trials and tribulations I went through from a total 3D modelling virgin to my current padawan level (still much to learn). However due to the gremlins out there, a little bit of pilot error and maybe a drink too many one evening that thread has unfortunately gone to the great trashbin in the sky. So this gives me a chance to start afresh and try to make this one more concise with various information I've gathered over the months. Just to give you a bit of background I started with a 'Delta' printer called the magician by a company called Biqu. This on paper was superb, fully assembled, had a 32bit cpu, auto bed levelling, touch screen, basically everything you needed and it was less than £150 delivered. Although it did also have a couple of drawbacks in that it was only really able to use PLA filament, had a non-heated bed (not a problem for PLA most of the time), and a small build area of 100mm circular by 150mm height. But the real problem was over a 2 month period I had 3 of them due to unreliability issues, the biggest problem being the power supply which blew on two of them. So at this point I was in a quandry, the whole point I picked the Magician was because it was fully assembled and I just felt happier with that as with no knowledge of 3D printers felt it was an easy introduction. Anyway I eventually took the plunge and bought a Creality Ender 3, this cost me just under £200, was a kit (although most assemblies were built you just have about a dozen components to put together, then wire it up etc), did not have auto bed levelling, no touch screen (LCD menus with a knob/button combo) and it was not a 'Delta' printer instead it was a more traditional 'Prusa' style setup (movement in the X-Y-Z axis's). It turned out though to be a revelation and its plus points was it has a build area of 220mm x 220mm x 250mm (width, depth, height), a heated print bed so you can use other types of filament such as ABS, PETG, and in theory TPU, Nylon and other exotic materials. Although as I've learnt everything except PLA has its advantages and drawbacks which I'll expand on as time goes by. The best news was though apart from my trepidation of assembly (no idea why I've built numerous PC's and servers over the years) the machine went together like a dream and has generally been exceptionally reliable and produced some great prints. Sure the bed levelling can be a pain and the interface is old fashioned and clumsy, but it has worked beautifully. I did have one problem where a MOSFET blew on the motherboard, but I easily got that replaced by the supplier and was up and running again very quickly. In fact I was so happy with the machine that I eventually ended up buying a second one to leave at my girlfriends so that I can print no matter where I am lol! So that now brings me up to today. There has been quite a bit of talk about my version of Daisy which I finally completed and have produced prototypes of which have been nicely received (check the relevant thread). But today's big announcement is the addition of a new printer to my arsenal, having got used to the Ender 3 I had been tempted to get a 2nd one for home so I can have one printing stuff while I have another available to mess around with prototypes etc... I did around the end of November get a Geetech A10M which is fundamentally an Ender 3 clone, but with a dual extruder setup which allows you to have two rolls of filament that feed through a single nozzle, so you can print in one colour or the other or indeed a mixture of the two which did appeal. But unfortunately this turned out to be an out of box failure and went straight back to Amazon as I couldn't face another Magician debacle. So until then I had sat on the fence looking at other options. A lot of other printers out there didn't really do much more than the Ender 3, the Creality CR-X was expensive and although featuring dual extruders was not as flexible as the failed Geetech as you could only print in one colour or the other and you had the overhead of a 'purge' tower which effectively was wasted material. It was also pricey and apparently the quality was not good suffering from things like artefacts. An upgraded 'hot end' and fan assembly. Dual Z axis screws/stepper motor setup. An upgraded all aluminum extruder with dual geared drive wheels. A filament 'out' sensor so that in the event the filament runs out the machine can detect this and pause the print. Improved stepper motor driver chips which effectively makes the printer silent apart from the fans. Thanks for starting a new Thread Nigels. Wow, you are really into this new hobby Nigels. This new Printer looks so easy to put together out of the box and well made. It also looks really tall and so quiet. Are you able to print larger and taller with this one? (01-19-2019, 12:35 PM)Super Wrote: Thanks for starting a new Thread Nigels. 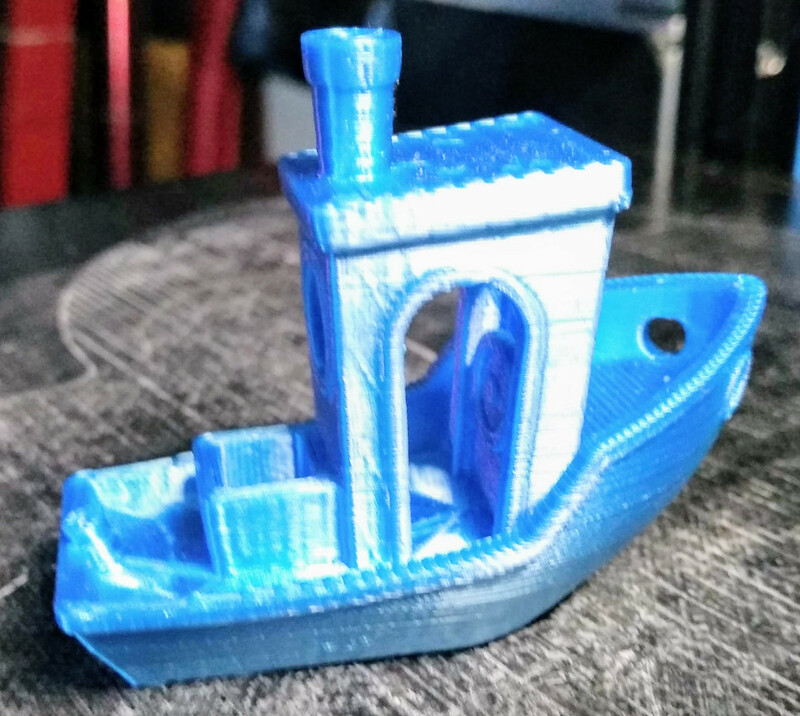 FDM - Fused Deposition Modeling - the basis of the majority of most hobbyist type 3D printers that use filament, what this fundamentally means is that the model is built up from a build plate one layer at a time. The material (typically a plastic product) being deposited in a molten layer which is then cooled before the next layer is deposited. SLA - Stereolithograph Apparatus - is the other readily available type of hobbyist 3D printer. These were until recently very expensive, but like most things are becoming more affordable, although expect to pay in the region of £400 for an entry level model. Like an FDM printer these build up the model layer by layer on a build plate, but unusually do this upside down by 'dipping' the model into a liquid light sensitive resin which the printer then exposes the next layer to a focused exposure of light from either a laser or in the cheaper models a specialised type of LED (Light Emitting Diode). The advantages to SLA printers are their level of detail which can be down to 25 microns per layer. The disadvantages currently are very limited build areas, the cost of the resin, the fact the resin is actually extremely toxic and needs special handling, also the post printing curing process that is required, this is multi-step involving cleaning the model in isopropal alchohol to remove any surplus resin and then curing the model (to harden it) using UV (ultra violet) light. 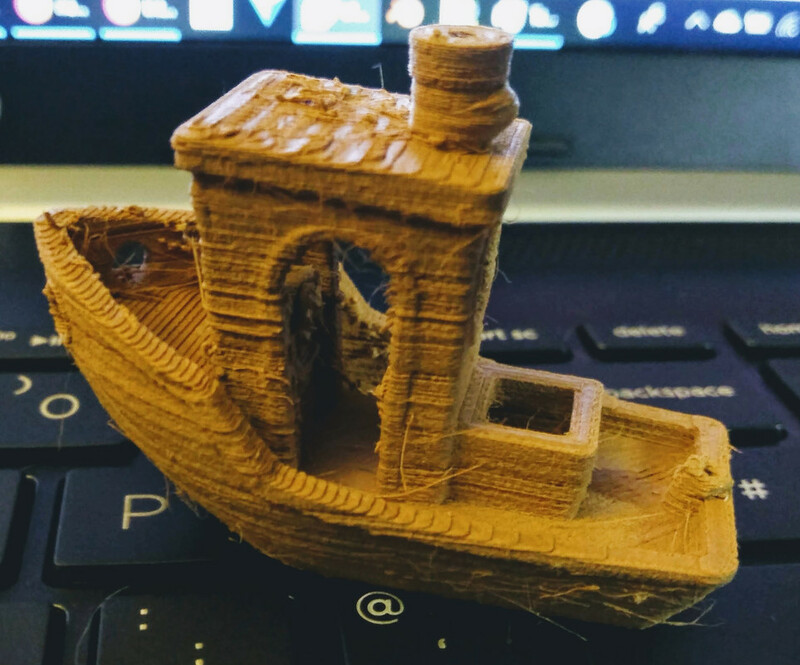 So these types of printers are ideal for someone who needs to produce small highly detailed models and is willing to handle such volitile chemicals and go through the post printing processes. For 'normal' sized models or large models FDM is usually more suited, although a good FDM printer can produce very good say gaming miniatures so SLA is really quite specialised at the moment. PETG - Polyethylene terephthalate (PET) is the most commonly used plastic in the world. ... On the 3D printing side of things, there's PETG, which is is a modified version of PET. The 'G' stands for “glycol-modified”, which is added to the material composition during polymerization. The most common world item made of PET is your average mineral water bottle. This illustrates nicely the main properties of PETG, the fact it is semi flexible, can be clear and is readily recyclable. In the FDM world this is ideal for many artistic type products like vases, statues etc... and is available in many transparent colours as well as clear in addition to the more normal PLA/ABS solid colours. 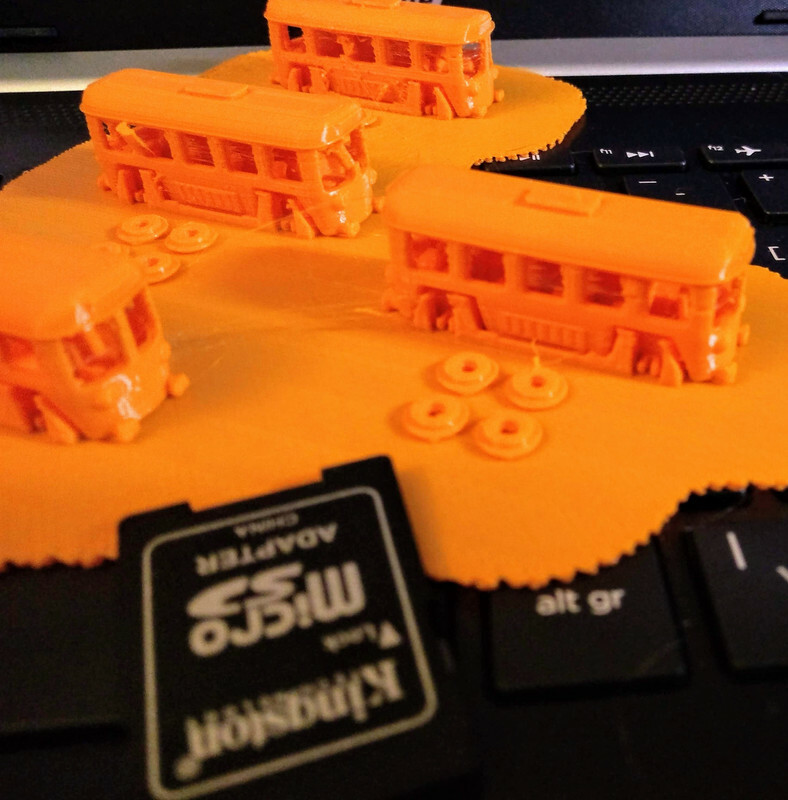 It is somewhat easier than ABS to print but more difficult to use than PLA. It uses temperatures in between both of those products. Its main drawbacks can include that it is somewhat stickier than PLA/ABS so you can end up with a product that bonds to your baseplate too well and make it difficult to release the model. It is also subject to stringing more readily due to this viscosity issue so you will likely get some 'spider web' type effects between elements of a model if it is so designed with upright elements as it stretches and leaves a thin 'string' between the model elements as the hot end travels between them. This is not as disasterous as it sounds, although it can be annoying, one way to remove it is to use a hot air gun. Hot End - this is the 'business' end of an FDM printer, typically made up of a 'heatsink', 'throat' (connecting pipe), nozzle, a heating element and a thermistor (heat measuring device) all wrapped up in a housing with fans for both cooling the heatsink and also for cooling the printed layer. This is all fed filament by either a 'direct drive' mechanism or a 'bowden' setup - more of both below. It's job in life is to reach a suitable temperature for the filament type in use to allow it to melt and then be 'extruded' onto the print bed to form a layer of deposited material. There is of course quite a bit more to it than that which results in all sorts of designs with various advantages and disadvantages, but fundamentally that is it. The main thing that you can vary on your FDM printer is the nozzle size, the most popular is a 0.4mm size, this gives a good trade-off between extrusion rate (i.e. print speed) and detail level. 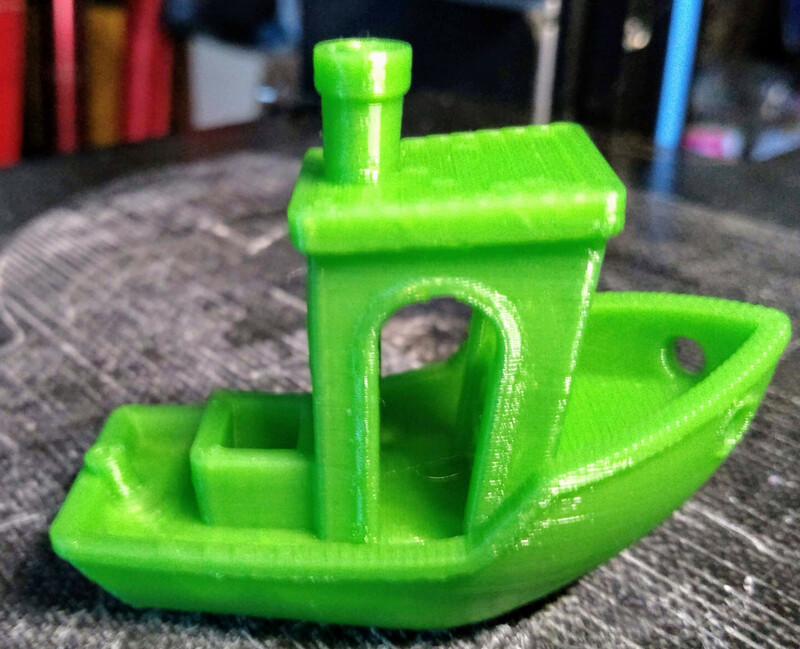 However you can typically get them in sizes such as 0.1mm, 0.2mm, 0.3mm, 0.4mm, 0.6mm, 0.8mm, 1.0mm, and 1.2mm the tradeoff being the larger the size the quicker the print, the smaller the size the better level of detail you can get. However this can all also be governed by the layer height, print speed and other various settings on your FDM printer. Extruder - the piece of hardware that pushes the filament into the hot end thus feeding the layer printing. These come in many different designs, but fall broadly into two main categories. 'Direct Drive' where the extruder is mounted directly onto the hot end assembly and 'Bowden' where there is a flexible PFT tube connecting the extruder to the hot end. Again there are trade-offs between these two main methods. The main advantage to a direct drive unit is the feed is easier, has less resistance and makes use of 'flexible' filaments easier due to the short transit path. The downside is that this increases the weight of the hot end assembly drastically as it will include a stepper motor to drive the extruder, this added weight making it harder to accelerate and decelerate the hot end assembly which can result in artefacts and other undesirable effects. Conversely the Bowden method can cause issues with flexible filaments, has the danger tha the PFT tube can get damaged causing feed issues and even under certain circumstances can result in the end of the tube that feeds into the hot end getting burnt/melted if using a high temperature filament. On the plus side it reduces the weight on the hot end which can result in more accurate prints. So the choice is really down to what sort of filaments you use mostly and what trade-offs you are prepared to accept. These days 'Bowden' setups tend to be the most common. Delta/Kossen Printer - This is one of the two main types of FDM printer. On these printers the hot end assembly is mounted on the end of three pairs of arms which move up and down and allow movement of the hot end in and direction (X/Y/Z - Sideways/Back and Forth/Up and Down). This means that the bed is stationary resulting in less vibration and theorectially you can also print quicker. It does however rely on the stepper motor setup being very well calibrated. One other main feature of a Delta printer is that the bed is circular in shape with its 'home' position 0/0 being the centre of the bed. Cartessian Printer - The other main FDM variant, in this scenario the printer has a frame that allows the print head (or bed) to be moved in any of the X/Y/Z planes. In some setups the bed may move back and forth, others it may move up and down. Depending upon the configuration of the bed movement the hot end may move either sideways/back and forth (with a bed that rises and lowers) or sideways and up/down (with a bed that moves back and forth. The bed shape on these type of printers is square with a build volume made up of X and Y, so it can on some machines be rectanglar rather than square. Its home position will be one of the corners, typically the left front. Like many things in the 3D printer world each choice has its own advantages and disadvantages. But you pays your money and takes your choice. 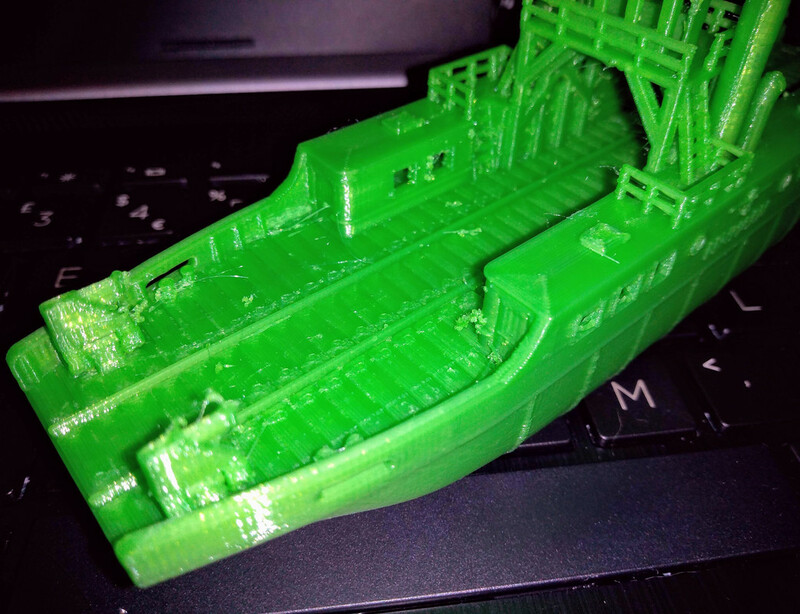 The first one is an example of one I printed on my original Delta 'Magician' printer, you can see here the printer had issues with quite a few things including the lack of smoothness in the hull, the 'stringing' in the window arch etc... So although not the worst I've seen it is not the best either. In this instance though the limitations were not down to the filament, but rather the hardware. Ok, well I came across this model the other night, it is of a 'German Island Ferry' which carries both road and rail traffic. I've printed this out at the published size just to see what its like and it is quite impressive, I'm now thinking of scaling it up and replacing the existing rails with either (or both i.e. two versions) HO or Tomy tracks. What you guys think, would this be of interest either as a standalone scenery piece or maybe with Tomy track with connectors as a sort of fancy bridge?!? Is it simple to upscale an item in the software, like just clicking a button with the percentage of the size you want either up or down like an Injet Printer? I am imagining that a drastic difference either way would affect the details a lot. There are several ways to do it, you can either re-size the model in a CAD package like design 123D which is what I cut my teeth on (unfortunately now defunct and out of support - but it still works fine so I continue to use it). In there you have two options a simple scale option where you can just drag or specify the size you want (up or down), or a smart scale that allows you to stretch (or compress) the item in any plane. The other choice is to use the scale option in the slicer of your choice, mine being Cura as its freeware as opposed to the other popular package Simply3D which is said to be better (i.e. offers more options at a potentially higher learning curve) which costs $100+ Personally I don't see too much difference in what they do, at least not enough to buy Simply 3D , in Cura you have a scale option also, by default that scales uniformally across all planes, but this can be turned off. eww..still not 3D printing for dummies yet. Too much for me to absorb but I can wait until it keeps getting simpler. Question: Weren't the earlier 3D printers enclosed with a door and now they all look like they are open framed. What was it about the early ones that had to be enclosed? Several factors around the enclosures Super. Firstly before the rise of PLA the main material in use was ABS. 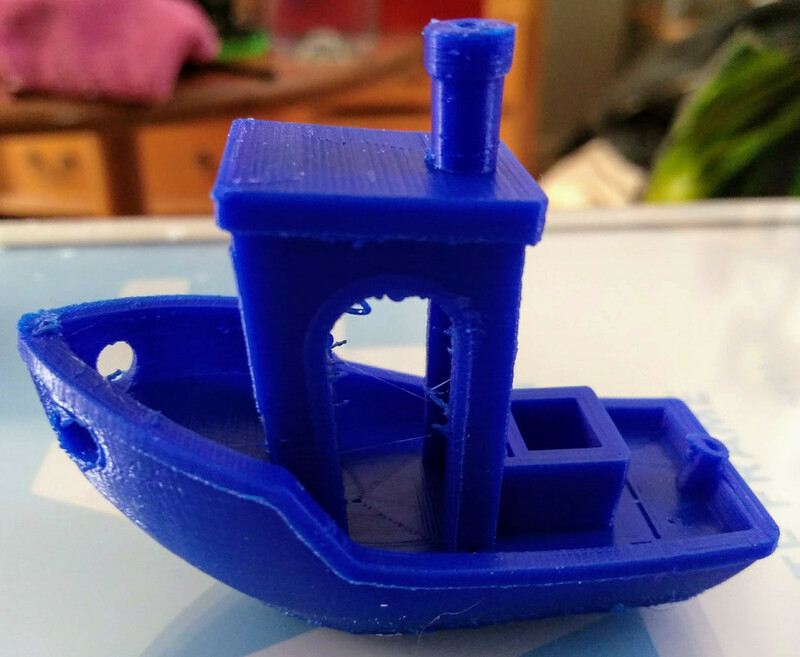 While ABS is generally stronger when printed correctly it suffers from several problems, the level of detail is not as good as PLA, it needs much higher bed/nozzle temperatures to work properly, it also suffers from 'warping' if it cools too quickly as well as delamination of the layers. Having the printer enclosed you can control the temperature more accurately and allow the model as well as individual layers to cool more slowly thus reducing the chance of warping and layer seperation. Phew, and I was trying to make that easy lol! Should have just put "you don't need an enclosure unless you print a lot of ABS material"
Thanks for the explanation Nigels. I always assumned that when 3D printers were in their infancy that there was a chance for hot plastic to splatter or explode if not done right and it was necessary to enclose the machine to protect oneself and property....obviously, now, I know I was wrong.